It's been a while since I wrote about my various game store visits. As a reminder, this series recaps my thoughts and reviews of various games stores that I've visited since I entered the hobby, back in 1982 or so. My intent was to write about my visits roughly in the order that I discovered each shop, but I've done a few out-of-order due to extenuating circumstances. Today's entry is for Brookhurst Hobbies in Garden Grove, California. This was the second of two stores (the other being the Last Grenadier) that I had first heard about in a small classified ad in Dragon magazine, years before my family moved to Southern California. After we moved here in 1986, I didn't visit it, primarily because, living in eastern Los Angeles County, Garden Grove (in Orange County) may as well have been in another state, especially to someone like me who didn't have a car and was living in public transportation-starved Southern California. My initial exposure to the hobby of "gaming" was via Dungeons and Dragons (both the Moldvay Basic Set and 1st Edition, almost simultaneously), and my gaming group did not use miniature figures for our games. We only used the rule books, modules (adventures), dice, and paper. Most of this stuff I could find at the various retail outlets that were available to me at the time, even if they weren't always all that well-stocked. The chances were that I could at least find the latest AD&D hardback or module at a Waldenbook's or Gemco. Flash-forward a few years, and I discovered All Star Games in Diamond Bar, California, which is about as far south as you can get in Los Angeles County before crossing over into Orange County. Around this time, also, I had somewhat moved away from role-playing games and gotten into collectible card games and also miniature war games, specifically Warhammer 40k. During October of 1993, I had been laid-off from my very first advertising job after they lost a huge client. I was still living at home and I actually got a whopping two weeks' of severance pay (I'd only worked there for about six months) and I'd saved money during that six months because I had no rent or utilities to pay, or groceries to buy. Everything aside from my car payment was covered. My friend Mike got me into 40k, and we of course began to collect as much product as we could. All Star Games had a very good selection, and Games Workshop seemed to be coming out with new guides and figures almost every week, for different chapters of Space Marines, or Space Orks, or Eldar, or what have you. We bought tons of figures, books, paints, and brushes, and All Star Games was very well equipped and would even special order things for us. However, after a while of assembling and painting scores of plastic and pewter 40k miniatures, we felt ready to begin experimenting. A Warhammer book about customizing miniatures had come out, and there were some really cool ideas in there that we really wanted to try. These were really advanced projects that involved steps such as sawing parts off of models and using drills and wires to assemble new designs of your own making. The 40k customizations were, to us, amazing, and we really wanted to start experimenting with some of those projects. However, All Star Games didn't carry any kind of modeling equipment beyond paints and brushes. No pin drills. No vices and saws. Nothing. And, we couldn't find another store in the area that carried anything like that, so we were stuck. A short time later, my on-again, off-again girlfriend at the time (we were "off" at this time, but still hanging out... a lot...) mentioned that she had heard of a store in Orange County that carried that kind of stuff. I have no idea how she heard of it, because she was never into gaming (continually referring to my friends and me as "dorks" over our love of games, comics, Star Wars, and Monty Python style humor), but she mentioned it, and agreed to go with me to visit the store, about 30 minutes or so away. This is the same girl with whom I visited the Last Grenadier on my first visit. She told me the name of the store, and I remembered having seen their ads back in Dragon. I was excited to visit another one of these "big game stores" from my youth, but I was a bit wary, as I recalled the last time I had visited a game store with this girl, she quickly became bored and we left after only about 15 minutes, despite having driven about 25 minutes one way to get there. We entered the store, and as I recall, it was almost divided into different sections, with one section being dedicated to modeling equipment. This was the only time I can recall visiting a game store and not making an immediate beeline toward the RPG section - instead I headed right toward the modeling display and loaded up with all of those things I needed for the fancy customization projects, including not only the pin drill, vice, and various saws, but also modeling clay and various new paints and brushes that my local store didn't carry. I do recall briefly glancing over toward the RGPs on my way out, but I didn't actually browse their inventory. I was fully into 40k and hadn't played an RPG at that point for probably four or five years. We unfortunately didn't stay very long (lesson learned - only took me two times to figure it out), but I do remember the staff being very friendly, and the store being very well laid-out and it being easy for me to find what I was looking for. I also remember that the store felt huge, even though I didn't explore the entire place. That was the only time I visited Brookhurst Hobbies. I just checked, and they are still open for business! Their website lists a bunch of their offerings, which includes games, cards, hobby supplies, miniatures games, diecast, radio control, and tons of other things. It's making me very interested in going back for a visit. Anybody in Southern California visit recently? Leave a comment to let me know about your experience! As with all of my comic book overviews, I will attempt to explain what makes this comic interesting without giving away any spoilers. Today's post is a bit different - rather than talking about a comic I'll be picking up later tonight, I wanted to provide two examples of some recent comics to illustrate some of the things I love so much about comics. I know there are a lot of people out there who don't understand why an adult would want to invest time reading about "guys in tights who punch each other." I've met a ton of parents at my daughter's school who think this way and wouldn't stop to pick up a comic to check it out. "If you put on a TV for the first time and saw Mickey Mouse, you wouldn’t just shut off the TV and say that it’s all cartoons so it's meant just for kids, right?" However, most people have this same reaction to comics. They were exposed to them as kids, maybe, in the form of superheroes, and they never bothered to shake that perception. Meanwhile, just like any other form of entertainment, there are dozens and dozens of different genres of comics - science fiction, fantasy, crime, horror, historical, novel adaptations, and more. On top of that, comics as an art form can tell a story differently than any other medium. Contrary to what some people believe, the art in the comic isn't a "crutch" - it's not there to replace what you can imagine. Rather, it's an integral part of the story-telling process in a graphic form that can relay information and emotion different than a prose book or even a movie. I hear a lot, "I guess I'd like comics but I just don't get the pictures. I'd like a regular story better." To me, that's kind of like saying, "I'd like musicals if it weren't for all the singing and dancing." You accept the singing and dancing as part of the formula for a musical and you recognize that it's a different type of medium than a straight-forward movie. The same is true for comics. 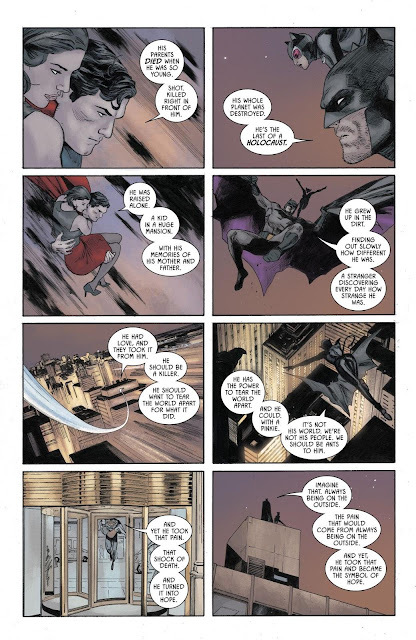 And, I do understand that, to the novice comic reader, the unique combination of art and words on a page can be distracting or even confusing, but if you just settle in and give it a chance, I think you'll be quite surprised by the way the two work together to create a unique story-telling experience. Here are two examples of different things I'm reading in comics lately, to illustrate my two main points: the comics aren't all just about superheroes, and also that the images and words together are part of the overall story and that the words alone wouldn't necessarily create the same impact. This is from a comic called "Lazarus," by author Greg Rucka, who is is a long-time comic writer and recently has been writing Wonder Woman for DC Comics, among others. 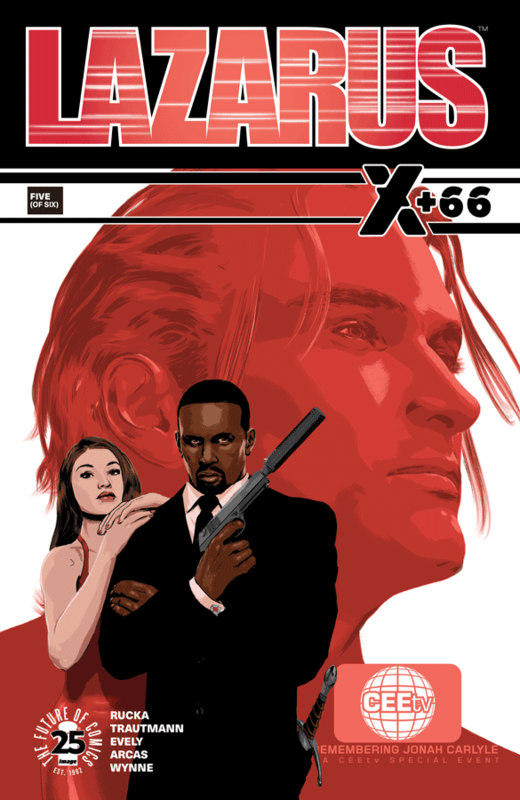 Lazarus is a "creator-owned" title, meaning he owns the rights to the characters and concepts, and is published by an independent comics company called Image. It's been around since around 2012 or so, and has recently been licensed for a role-playing game by the awesome folks at Green Ronin Publishing by +Chris Pramas. It's also been optioned for an Amazon series. "The world now lies divided not amongst political or geographical boundaries but amongst financial ones. 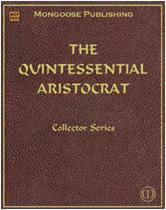 Wealth is power, and that power rests with only a handful of families." "Healthcare and poverty are intertwined, folks. Never mind the debilitating cost of medical care, the fact of financial insecurity leads to legitimate health problems. Instances of obesity in poor communities in the US aren't a result of sloth; they're the direct result of being unable to afford a healthy diet. When you're poor and your'e hungry, you'll seek the food that's most filling, not the most healthy. Pasta is cheap. It's also a crappy diet if it's all you can afford. Health food - fresh food, fresh veg, grains, lean proteins - are expensive. Poor diets lead to innumerable, and well-documented, complications, everything from heart disease to diabetes..."
Probably not what you expected from a comic book, right? Yes, it's in the "back-matter" (in the back pages of the book, and not part of the actual story), but this kind of thinking informed the story that the writer wrote. And, whether you agree with his assessment or not isn't really the point. The point is that it makes you think and maybe question things a bit more, as all good forms of writing should do. 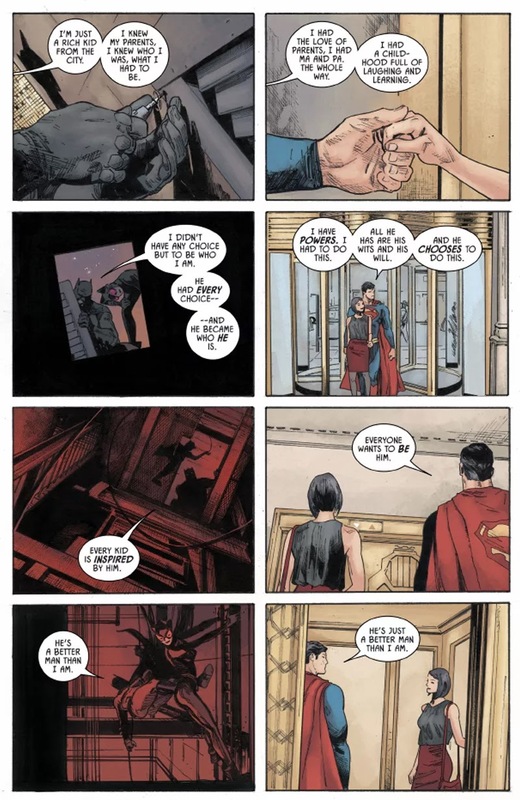 The second example is going to illustrate a unique side-by-side panel layout to tell an emotional story of two characters who have known each other for a long, long time. Currently in the comics, they are depicted as usually being at-odds with one another and each other's methods when dealing with the world. However, they have a long history and can be counted on to help the other when push comes to shove. One of the characters is married. The other just got engaged. Both of the characters' significant others are wondering why the two aren't talking to each other. Why isn't the one character telling the other that he's now engaged? Why does the other character, who knows already, not congratulating the first? A discussion happens wherein each of the two main characters tries to make an excuse - "He's too busy..." or "I'll get around to it..."
Then, this beautiful two-page sequence happens. It's easily one of my favorite pieces of comic writing and art in recent memory. I will point out that this is going to spoil a somewhat major thing that happened recently in DC Comics, but chances are if you've gotten this far, you've either already read it, or weren't planning on reading it. That's a unique kind of story-telling device that can't be replicated in any other medium, and which still gets to me every time I read that sequence. I hope I've helped explain a bit about why I read these things and why I am a big proponent of the medium. I'd love to hear your thoughts and comments below, or on my Google + page, Facebook page, or Twitter (links are all to the right-hand side).